This piece was co-written with Cyrus Lotfipour, a senior analyst at MSCI ESG Research. Food production and power generation are two of the thirstiest businesses in the United States, accounting for more than 80 percent of U.S. water withdrawals. And because electric power plants and other water-intensive industries are often located in areas with thousands of acres of irrigated agriculture, there’s a clear potential for conflict. Water stress – high competition for limited supply – in those areas could have serious consequences for hundreds of millions of people in the United States and around the world. A new report, Corn or Current? 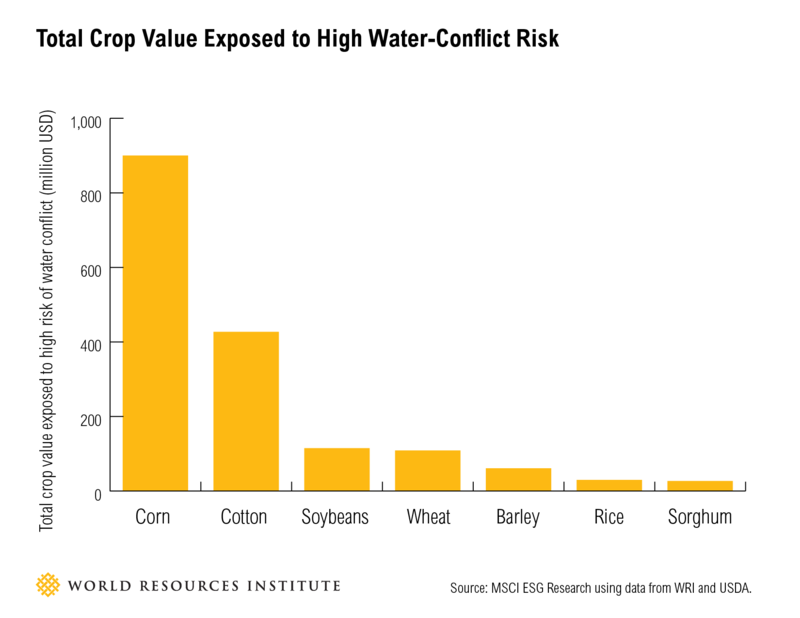 The Agro-Industrial Water Conflict, shows where conflicts between industry and agriculture for limited water supplies could be most severe. MSCI ESG Research, a leading provider of environmental, social and governance (ESG) screening, analysis and ratings, used data from WRI’s Aqueduct Water Risk Atlas to evaluate agro-industrial water conflict (see sidebar) for 110 publicly traded, water-intensive companies operating in highly irrigated and water-stressed U.S. counties. 1) Identify U.S. counties exposed to elevated water stress, as defined by the WRI’s Aqueduct Water Risk Atlas. 2) Assess water demand from agricultural users by focusing on the percentage of land that is covered by irrigated crops. 3) Map company facilities to specific locations and determine the percentage of total production attributed to each site. The report found that competition for water in stressed areas between power generators and other industrial users and agricultural operations could create stranded assets (see sidebar), reduce overall productivity, create community conflicts, and threaten food and water security. Thermoelectric power production accounts for 41 percent of U.S annual water withdrawals. And electric utilities, according to MSCI ESG Research, are 11 times more water intensive than all other industries combined and more than twice as water intensive as the next most-intensive industry, paper manufacturing. Nevertheless, approximately one in every four electric utilities operates in irrigation-intensive and water-stressed U.S. counties. Electric power generators, therefore, face more agro-industrial water risks than any other industry. Stranded assets are assets that have suffered from unanticipated or premature write-downs, devaluations, or conversion to liabilities. For example, in the mining, oil, and gas industry, the availability of water resources could restrict company access to mineral and energy deposits, making these inaccessible for commercial production and transforming them into stranded assets. 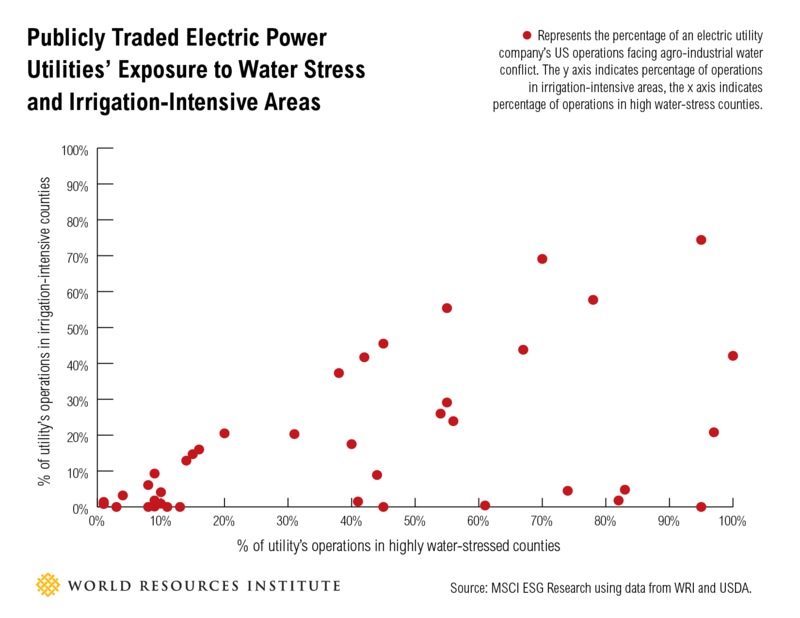 Previous analysis from MSCI ESG Research indicated that approximately $21 billion in electricity sales from publicly traded utilities could face water risks, most likely in water-stressed and drought-prone areas where much of the land is used for farming. For example, in 2010, higher water temperatures forced the Browns Ferry Nuclear Plant on the Tennessee River to reduce generating capacity by between 40 and 60 percent for 45 days. Drought and increased competition can reduce the volume of fresh water flowing through a river. With less water, sunlight increases water temperatures more quickly. In cases like Browns Ferry, a power plant is forced to cut back on the electricity it generates to avoid overheating. This could mean significant financial losses for the electric utility and more vulnerable energy security across the grid. As a percentage of total U.S. production, the volume of corn, soy, and wheat at risk is relatively small (between 0.2 and 1.2 percent of total harvested acreage). But for crops grown only in specific regions, like cotton and sugar beet, the percentage of crop land at risk can be up to six times higher. Across the United States, up to $900 million worth of corn and $400 million worth of cotton crops are exposed to high agro-industrial water conflict. If not managed, agro-industrial water conflicts can represent a material risk to farms, businesses, their investors, and everyone who depends on their services. Adequate water governance coupled with responsible natural resource management by the private sector is needed to mitigate these risks and to improve energy and food security. Specifically, there are two things that can help support ongoing efforts by energy utilities and farmers: increased public investment in the collection, monitoring and disclosure of water-related information; and increased incentives to drive more collaboration across industry and agriculture to find conflict-mitigating collective solutions.